This is another in the superb series of recent Wisden anthologies following in the footsteps of Wisden on the Ashes and Wisden on Yorkshire. Tracing ,through the revered pages of Wisden, the annals of the current first-placed Test and ODI country, this fine book recalls India's humble beginnings with a tour to the U.K by the Parsees in 1886: Wisden states the tour as being a failure and not much coverage was given in the 1887 almanack and, although Wisden of 1889 could not devote much more space, it did acknowledge an improvement. One hundred and twenty two years on, readers are made aware of this fascinating country's rich cricketing heritage through reports, rare photographs, India's Wisden Cricketers of the Year and obituaries as seen through the eyes of some of the finest writers of the day. Ravi Shastri has written an excellent and moving Foreword paying great respect to Wisden, his apparent disappointment at not being one of the Five Wisden Cricketers of the Year and how useful the Cricketer's Bible is to him in his media role. There is also a miscellany at the back of the book which touches upon some light-hearted matters but also some sad ones. One can see how much cricket means to the people of India and maybe this is summed up in Jonathan Rice's acknowledgements when he says "I have been told that the four most important things to Indians today are God, family, cricket and Bollywood, in that order. In Sachin Tendulkar, at least three of those important things are combined." As I write this, the 2000th Test and 100th between India and England is just a day away. By the time this may be read, Sachin Tendulkar may have blessed this historic occasion with his own 100th international century. There are other interesting tales within this book. Charismatic current captain, M.S. Dhoni, and his parents’ struggles with eunuchs seeking large amounts of money for giving them blessings. Having had a similar confrontation, I can imagine the unpleasantness of this and was myself lucky when my confronter went off with 20 Rupees. The blessings which I received did not bring me luck. There are interesting articles on the first ever India and Pakistan's first ever Test match - indeed, Pakistan's first Test - as well as India's first ever Test victory over Australia as well as a profile of Bishan Singh Bedi, who never quite, like Shastri, became one of Wisden's Five Cricketers of the Year. Moving onto more modern times Wisden initiated its Leading Cricketer in the World and Virender Sehwag, a two time winner, is profiled and other excerpts include the IPL and the first ever Twenty20 World Final won closely by India over Pakistan. 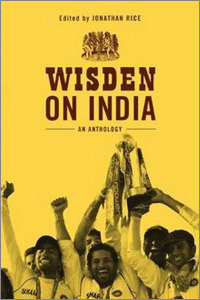 Like the other Wisden anthologies, Wisden on India is a fascinating book covering everything which any cricket historian or Indian fan will surely love reading. Jonathan Rice describes the book as "...not a history of Indian cricket. It is a pot of trinkets, to be dipped into and enjoyed as a reflection of the way that cricket's greatest publication has looked at cricket's greatest conquest, India." It is a fascinating and enjoyable read.